Leslie McDonald is author of five previously published books. Active professionally in the horse industry for over 40 years, McDonald grew up in Chicago,IL. She graduated from DePauw University. A gold medal dressage trainer and popular author, she lives with her husband,Doug, on a horse farm in southern Ohio with five Swedish Warmbloods, two Labrador Retrievers, and a Corgi. Her latest book, Journeys with Horses, will launch June 15. “How great a sacrifice for the love of a horse? How much of one’s self can be entwined with that soul? What limits are we willing to push to save a bond forged in love and tempered by time?” The passionate bond that exists between humans and horses is not an inherited trait. People from all kinds of backgrounds and upbringings find themselves lured into the stable where a powerful, 1200-pound creature of fantasy on four legs captures their hearts and their souls. Children develop a horse-crazy passion, often without any encouragement from their families. This passionate craze may last a lifetime, or it may fade over time, but the passion is true and the connection rare. 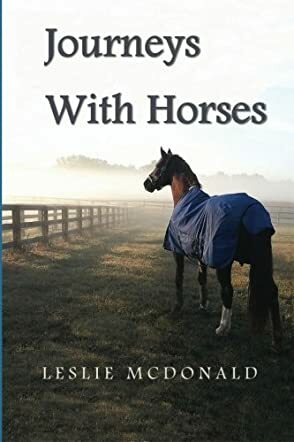 From author, horse enthusiast, and Grand Prix level dressage trainer Leslie McDonald comes a rare and heartfelt collection of stories and musings about horses and the people who quite literally fall in love with them. Journeys With Horses is exactly what its title suggests: a journey. There are stories about trainers and riders, and horses of all sizes, shapes and descriptions. From children dreaming of owning their own horse, to the awesome beauty and power of the Temple Lipizzaners, to the brave and heroic horses of wartime, this story collection has it all and the stories are told with a clearly evident love and knowledge of the noble horse. The author writes with pure equine pleasure for all to enjoy. A life partnered with horses is clearly a journey of adventure, dedication, and an unbreakable connection to a compelling soul, the soul of a horse. The reader will laugh and cry, but all in all, the reader will thoroughly enjoy these stories and they might even learn a little something along the way.